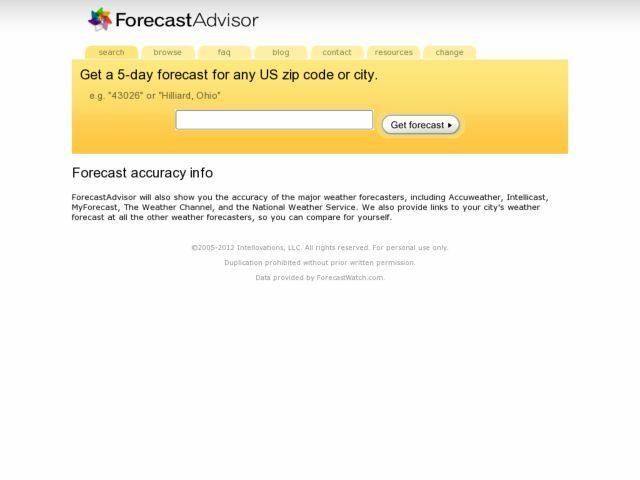 ForecastAdvisor will also show you the accuracy of the major weather forecasters, including Accuweather, Intellicast, MyForecast, The Weather Channel, and the National Weather Service. We also provide links to your city[HTML_REMOVED]s weather forecast at all the other weather forecasters, so you can compare for yourself. For the true weather geek, you can pull up past forecasts for that day to see how the forecast has changed each day, and see additional statistics for high and low temperature as well as precipitation forecast accuracy.